One of my favorite pastimes as a child, and even occasionally as an adult, was to sit back, look up at the sky, and watch the clouds rolling by. It is quite a game to pick out the shapes of familiar-looking animals and objects in the clouds. Who hasn't heard a child or adult exclaim, "I see a horse, there's an elephant," or "do you see the bird?" We take enjoyment out of creating recognizable-looking features out of clouds and indeed, even in other natural formations in the world around us. Just as we can look at the clouds and identify the familiar, so can we look at features of other worlds and relate them to our own experiences. Even planetary scientists play this game. One of the most widely recognized features on a world other than our own, is a mesa of resistant rock located in the Cydonia region of Mars. It has a strikingly resemblance to a human face, especially in older images taken by the Viking Orbiters. The Cydonia region is located along an escarpment that separates the relatively crater-free planes to the north from the heavily cratered terrain to the south. JPL scientists made the discovery of the "Face on Mars" in July of 1976 while searching for a landing site for the Viking 2 Lander. Wanting to give the public a familiar looking feature, JPL released the image to the right. Based upon the low resolution Viking images (which was the best the Viking spacecraft could do), several people claimed that the "Face" was artificial and not a natural geological structure. They also put forth the proposition that other features in the area proved that an intelligent civilization once lived on Mars and created the formations. This became fuel for a small number of conspiracy theorists that asserted that NASA was trying to cover up evidence of ancient intelligent life on other worlds. This argument is preposterous, especially when one considers that NASA has always been faced with budget cuts. The best thing that could happen to NASA would be the discovery of ancient life or technology on another world. This would give them an overwhelming argument in convincing Congress for a large budget increase dedicated to further space exploration. I am not aware of any planetary scientist who believes that these features are anything more than natural formations.One problem with using the Viking images as proof of something is that they are low resolution. At such a resolution the images do not reveal crisp surface features. But a number of laywriters seem to be able to interpret quite a bit from these low resolution images, and some have published books and "supermarket tabloid" reports about their impressions, flawed as they may be. At maximum resolution, the face measures 46 pixels wide and 56 pixels high. The next highest resolution image was approximately 40 pixels wide by 48 pixels high. 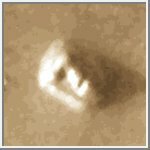 Fortunately, on April 6th, 1998 NASA's Mars Global Surveyor spacecraft imaged the Face from a distance of 444 kilometers (276 miles). The image had a resolution of 4.3 meters (15 feet) per pixel, which is ten times sharper than the best Viking image of the region. The face is about a mile across and a few hundred feet high. What some imagined to be eyes, a nose, and lips, now appear to be nothing more than peaks and ridges. Even though the Face has now lost much of its facial appearance, it is still fun to identify features that resemble things that we know. The following are a few other fun familiar-looking features to explore. First, Mars seemed to be greeting Mars Global Surveyor (MGS) with a Happy Face. Now, it seems as if the planet is sending its love with the this picture from MGS's Mars Orbiter Camera (MOC).